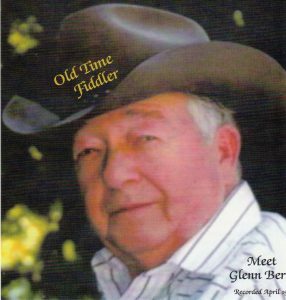 We lost Glenn Berry, February 2015, one of my all-time favorite fiddlers and all-time favorite people. Ever cheerfully greeting with kindness whomever he met and always with a story to tell, he brightened any gathering. His seemingly unending repertoire of wonderful melodies kept the tune hounds among us perpetually inspired. I have included many of these tunes in this column, beginning with Fat Back Meat and Dumplings in April, 2002 (Evergreen Fiddler Tunebook: Vol I) on up to John Tate’s Two-Step in August of 2014. Speaking of John Tate, Glenn played this wonderful minor tune for me one day, just saying that it was one he had learned from “Old” John Tate. Good enough for me, so that’s what I began calling it. I later learned that bluegrass musicians played it with a third part in A major, called it Land of Lincoln and that it was recorded in 1969 by Kenny Baker. It has been mentioned as one of Bill Monroe’s Uncle Pen’s tunes,* but also as one of Bill’s own compositions. ** While the core of the tune is the same, some of the details have diverged. The combined efforts of John Tate and Glenn Berry in shaping this version are quite compelling and it makes for a fine hoedown, one of my favorites to play and one particularly well suited to contra dancing. Thanks Glenn, we miss you. I don’t have a good recording of Glenn playing it so if you click on the link below, you get to listen to yours truly, along with David Cahn (see the February 2015 issue) on guitar and the amazing Simon Chrisman on hammered dulcimer. Simon, originally from Bainbridge Island, WA, has more recently toured and recorded with the Bee Eaters and has played bass in bands with the likes of Kimber Ludiker and Laurie Lewis.